With the leading position in Southeast Asia, Vietnam’s wood production and processing industry is under the spotlight of foreign companies and suppliers. Ingo Bette, a representative from German Woodworking Machinery Manufacturers (GWMM), said that Vietnam’s woodworking industry was still in its infancy compared to other regional markets like Indonesia, Malaysia, and Thailand. Today, the country has gone through very impressive development. Vietnam has surpassed its regional peers to become the largest buyer of wood processing technology in Southeast Asia, despite its scarce wood resources. 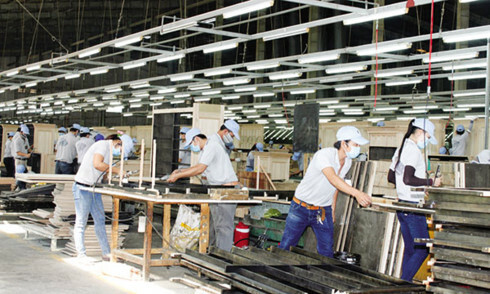 In addition, Vietnamese wood manufacturers have shifted from producing solid wood to indoor furniture. They have also improved their design competency to sell their own products on the global market. Thanks to the transition to more value-added products, GWMM companies have achieved sturdy sales performances in Vietnam compared to neighbouring countries. The association is looking to raise its market share in the country in the coming time. The American Hardwood Export Council (AHEC) ranked Vietnam as the second fastest growing global market for US-sourced hardwood lumber, following China in the number one position. Continuing its recovery from lows in 2015, the Vietnamese wood market’s demand for American hardwood was off to a great start in 2017. Through the first six months of the year, US hardwood lumber exports to Vietnam were up 18 per cent, led by a strong surge in the popularity of yellow poplar. AHEC’s international programme manager Tripp Pryor said, “Back in 2012, Vietnam’s market share in Southeast Asia was 67%. Through the first half of 2017, US hardwood lumber shipments to Vietnam averaged an additional two million board-feet shipped every month compared to last year. This growth added up to a significant increase this year, which will likely make 2017 the biggest trade year ever between the US and Vietnamese lumber and furniture industries. According to Hoai, Vietnam’s wood production and processing sector has achieved a double-digit annual growth of approximately 10% throughout the past decade. The sector slowed down some last year – with full-year exports valued at US$7 billion – but rebounded in the first 10 months of 2017 with a growth rate of more than 10%. Exports of wood products are expected to increase once the EU-Vietnam Free Trade Agreement comes into effect next year.